Article first published as Book Review: ‘Black Inked Pearl: A Girl’s Quest’ by Ruth Finnegan on Blogcritics. 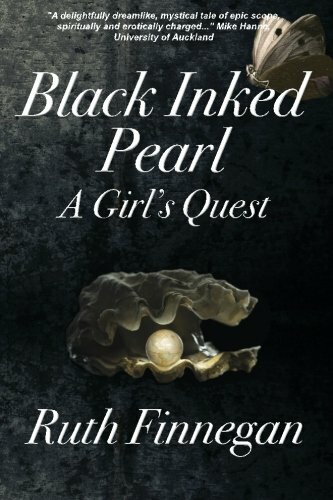 “Black Inked Pearl: A Girl’s Quest” by Ruth Finnegan is the story of Kate, who, at fifteen years of age, finds true love in a mysterious suitor, but rejects him out of fear. This decision, which she will regret for the rest of her life, sets her off on a quest to find him again. Traveling around the world and going through heaven and hell to seek him, she desperately does the things that she is guided to do, in order to end her mission and be with him at last. Along the way, she has unusual characters assisting her, such as a beetle named Micky. Kate is devastated during the times that she finds herself unexpectedly rejected by her love. Each of the personal sacrifices made by the couple affects the outcome of Kate’s journey; however, the end results in Kate gaining a pearl of wisdom for being able to discover who she truly is. “Black Inked Pearl” is in no way an easy book to read. Written with both poetry and mythology interspersed into the tale, the reader will sense many layers of meaning underlying each part of the story. The author’s words flow in such a way, that she seems to create a dream-like state for the reader as they are follow along with the girl while she passes through different challenges on her quest. I enjoyed having to actually think as I joined the protagonist on her journey. I also found myself drawn into the angst she felt as the result of the decisions she made early on in life. I could really relate to this part of her character. Incorporating both African and Irish mythology into the tale creates even more layers of depth. “Black Inked Pearl: A Girl’s Quest” by Ruth Finnegan is destined to be a classic novel. I highly recommend this novel to readers who enjoy classics that incorporate love and mythology into one tale. It would also be an excellent selection for an English or World Literature class. The notes included at the end of the story add literary validity to what the author has written, and would definitely enhance the learning experience. This includes references to famous works such as those by William Shakespeare. I would have been thrilled to have read this when I was in college! Highly recommended reading!